If you experience problems viewing this e-mail, click here for the online version. Dr. Doris Chu, Criminology, recently published an article (co-authored with Ivan Y. Sun) “Who is better for handling domestic violence? A comparison between Ta iwanese female and male officers,” in the July/August 2010 issue of the Journal of Criminal Justice (38:453-459). The paper examined Taiwanese female and male police officers’ perceptions of handling domestic violence. Specifically, it assessed officers’ attitudes toward whether female officers, male officers, or a combination of female and male officers are more suited for handling cases of battered women, offenders, and domestic violence overall. Data analyzed in this study were collected from 96 female and 156 male officers from two police departments in Taiwan. Frequency distributions showed that a combination of male and female officers were most preferred by officers for handling abused women, offenders, and domestic violence overall. Regression analysis indicated that female officers were significantly more likely than male officers to favor a combination of male and female officers over female officers alone for handling battered women. Female officers were found to be more likely than male officers to favor male over female officers and a combination of male and female officers for handling offenders. Police supervisors’ attitudes toward domestic violence also influenced officers’ attitudes toward who is more suited for handling offenders. Dr. Gauri Bhattacharya, Social Work, recently presented a research paper she co-auth ored with Dr. George Jacinto, Social Work, "Achieving Racial/Ethnic Health Care Equality: A Public Policy Dialogue," at the Sixth International Congress of Qualitative Inquiry, Urbana-Champaign, Ill. The theme of the 2010 Congress was Qualitative Inquiry for a Global Community in Crisis. More than 1,500 participants from 65 nations attended the conference. Dr. Bhattacharya argued that narrowing the gap between racial and ethnic health care access, utilization and outcome require understanding and meaningful interpretations of the contexts by which life experiences of discrimination, prejudice, and stress shape one’s expectations of health care quality. From a policy perspective, Dr. Bhattacharya proposed narrative communication as a powerful means for starting a public policy dialogue on the achievement of racial and ethnic health care equality. Dr. Amy Pearce, Psychology, and Dr. Al Romero, currently dean of the College of Arts and Sciences at Southern Illinois University-Edwardsville and former chair of the Department of Biological Sciences at ASU, have published in the Encyclopedia of Science and Technology Communication edited by University of Nevada-Las Vegas Professor Susanna Hornig Priest. The 2-volume encyclopedia presents resources and strategies for science communicators, including theoretical material and background on recent controversies and key institutional actors and sources. Science communicators need to understand more than how to interpret scientific facts and conclusions; they need to understand basic elements of the politics, sociology, and philosophy of science, as well as relevant media and communication theory, principles of risk communication, new trends, and how to evaluate the effectiveness of science communication programs, among other challenges. October is Domestic Violence Awareness month, and in an effort to draw attention to problems related to sexual assault and domestic violence, the ASU Counseling Center is sponsoring Sexual Assault and Domestic Violence Awareness and Prevention Week. Interactive educational activities, including a display, "The Silent Witness," will be held each day from 8 a.m.-5 p.m. in the Natural State Lounge in ASU's Student Union. The Silent Witness Project consists of life-sized plywood cutouts painted red and black. Each cutout represents a female victim murdered by an intimate partner from the most recent year and tells the victim's story on a shield attached to the cutout. Last year, 21 Arkansas women were murdered during acts of domestic violence. A video version of the Clothesline Project will also be displayed. Created by Arkansas Coalition Against Domestic Violence in 1994, the project is a collection of approximately 300 hand-decorated T-shirts displayed on a clothesline, with each T-shirt representing a woman killed in Arkansas by an intimate partner from 1989 to 2009. A candlelight vigil to honor victims and survivors of domestic violence will be held in the Student Union courtyard (near the Chi Omega fountain on Aggie Road) on Tuesday, Sept. 28, at 7 p.m. This annual event held by the ASU Counseling Center will individually commemorate the 21 Arkansas women who died due to domestic violence last year. Speakers at the event will include domestic violence survivor Carolyn Thomas, Certified Alcohol and Drug Counselor, and Tamara Pace, Miss Black Arkansas. For details, contact Dr. Phil Hestand, director, ASU Counseling Center, ext. 2318, or see the NewsPage release. The Presidential Search Advisory Committee will meet at 10 a.m. at the ASU System Office, 2004 E. Nettleton Ave., Jonesboro. Visit the website Arkansas State University Presidential Search for updates and news. The Department of Music will present the ASU Jazz Bands in concert on Thursday, Sept. 30, at 7:30 p.m. in Fowler Center’s Riceland Hall. The ASU Jazz Bands are directed by Dr. Ron Horton, director, Jazz Studies. For the opening concert of the fall semester the Jazz Band and Lab Band will present a concert entitled “Jazz in the Middle.” This concert will feature jazz musicians whose roots and professional development occurred away from the coastal regions of the United States. This concert will feature music of Freddy Hubbard, Stan Kenton, Thad Jones, and William “Count” Basie. The concert is free of charge and open to the public. For details, contact the music office, ext. 2094, or see the NewsPage release. ASU's Small Business and Technology Development Center (SBTDC), the Jonesboro Regional Chamber of Commerce, and the Downtown Jonesboro Association (DJA) will host a workshop for small businesses in Jonesboro, Thursday, September 30, at the ASU Delta Center for Economic Development, 319 University West Circle, on the ASU campus. The workshop will be held from 1-4 pm. The seminar, “Business Financing Options: How to Find Capital to Start or Expand Your Business,” will be conducted by Herb Lawrence, ASU SBTDC director and Robert Bahn, ASU SBTDC business consultant. The seminar is designed to show attendees how to use a variety of options in finding financing for their venture. Registration is $40 per person ($30 for Chamber and DJA members). Register online, and for other details, see the NewsPage release. The Arkansas State University Theatre announces the producti on schedule for the 2010-2011 theatre season. All performances begin at 7:30 p.m., and all performances will be held in the Drama Theatre, Fowler Center. 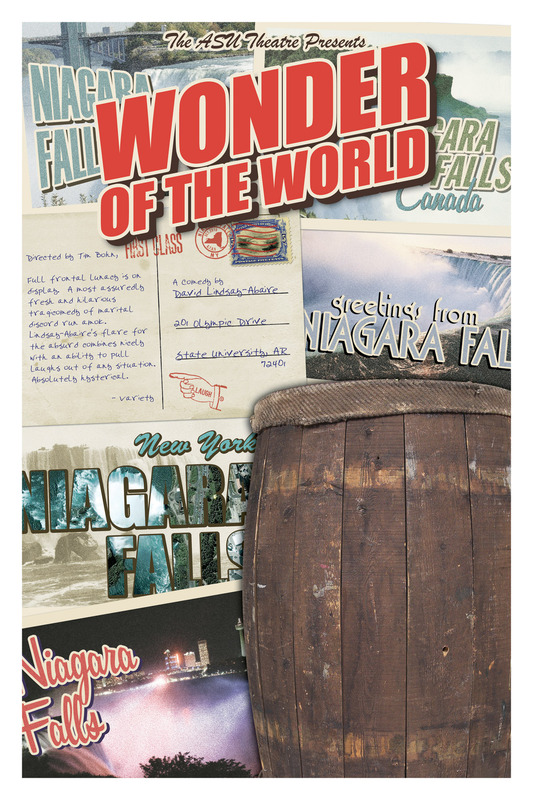 Opening the season will be “Wonder of the World” by David Lindsay-Abaire. Nothing will prepare audiences for the dirty little secret Cass discovers in her husband’s sweater drawer. It is so shocking that the heroine has no choice but to flee to the honeymoon capital of the world in a frantic search for the life she thinks she missed out on. 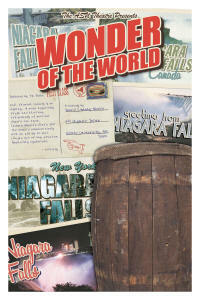 It’s a wild ride over Niagara Falls in a barrel of laughs as Cass embarks on a journey of self discovery. Variety says, “Full frontal lunacy is on display…a most assuredly fresh and hilarious tragicomedy of marital discord run amok. Lindsay-Abaire’s flare for the absurd combines nicely with an ability to pull laughs out of any situation. ..absolutely hysterical.” Performance dates for “Wonder of the World” are Wednesday-Saturday, Oct. 6-9. This play contains adult language and subject matter. Tickets for all performances are $8 in advance, $10 at the door. All seating is reserved. Tickets should be purchased in advance at the ASU Central Box Office in the Convocation Center, by calling 972-ASU1, or online. Advanced reservations are highly recommended. Visit the ASU Theatre online.